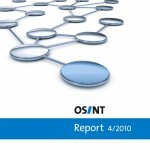 In this year’s final OSINT Report we examine the prevalent classification and safeguarding procedures in place for sensitive national security information. We provide a synopsis of definitions, and cast light on the complex interplay between officially required secrecy and publicly desired transparency. This was written by Jan Störger. Posted on Friday, December 17, 2010, at 16:51. Filed under General. Bookmark the permalink. Follow comments here with the RSS feed. Post a comment or leave a trackback.